The Goat Shed is situated in Peisey-Vallandry, right at the heart of the Paradiski ski area. Being ideally placed between the two extensive ski resorts of Les Arcs and La Plagne, direct access to the whole of the Paradiski ski area, is at your fingertips. 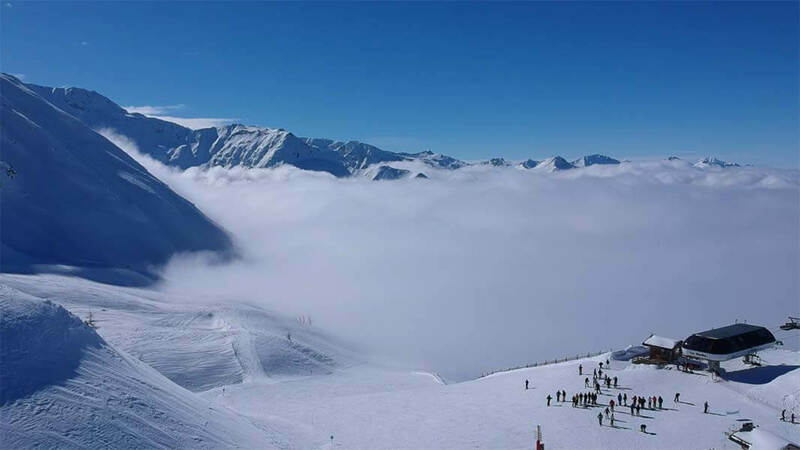 Peisey is linked to the main ski area by an open air cable car, which is 3 minutes away in the free resort shuttle bus, or our catered chalet guests can take advantage of our courtesy minibus which drops off right on the slopes. From here the Vanoise Express cable car or two high speed chair lifts take you in any direction you like. With over 400km of marked pistes, there is something for everyone – from friendly blue runs, to tree-lined reds and challenging black mogul fields. There are a number of different lift passes available, depending on your needs. We can pre-order passes for you at a discounted rate. Please contact us for details. For non-skiers or those who fancy a day off, there are plenty of other activities to enjoy; walking, snow-shoe hikes, husky sledging, sleigh rides, farm visits or relax at the spa. Although not everybody needs 232 pistes, 2 halfpipes, 31 black runs, 4 snow parks… etc. Needless to say – the largest ski area in the world*, has something for every ability. The glacier du Varet, on the slopes of the Aiguille Rouge above Les Arcs. 118 hectares of the pistes are covered by 314 snow cannons.